Our Terms and Conditions allow the online Lesson Plan and Worksheets to be used for immediate family, home use ONLY. Thank you for your honesty. Why do you think that Jesus needed helpers? 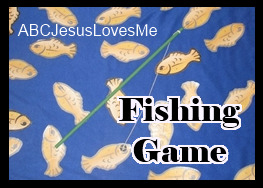 How do you think Jesus' friends felt when He told them that they would be fishers of men? What does a "fisher of men" do? When Jesus asked the men to "follow Me," did the men finish what they were doing or immediately follow? How can you be a disciple of Jesus? Verse: John 14:15 (NIRV) - If you love me, you will obey what I command. "I will give you rest, I will give you rest"
Make a hoop and then a line. That’s the way to make a nine! Name: Write the 1st letter of your child's first name using 3" Letters. - Color each disciple on the Jesus Calls 12 Disciples worksheet a different color. 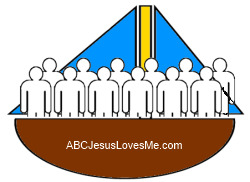 - Color and cut out the boat on the 12 Disciples printable. Glue the boat onto a piece of construction paper. Cut a slit along the top of the boat. Cut and color the men. Slide the men into the boat and glue down. - Play Follow the Leader. Take turns being the leader. Talk about how Jesus asks us to follow Him just like the 12 disciples did. Hide a timer. Provide the child with spatial clues of higher, lower, near, above, below, farther, up, or down to find it before the time expires. Trade to allow the child to hide and describe using spatial words. - Introduce the letters Nn using the tactile letters and decorate the Letter Poster to add to the Letter of the Week book. 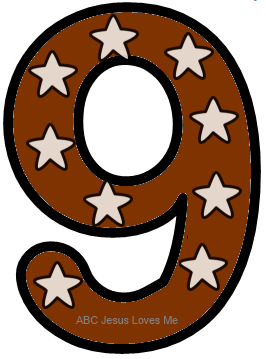 - This week glue on macaroni or other noodles (dye the noodles for extra color) to decorate the Number 9 Poster. Add nine stickers. The past five weeks have been preparing the child to write the first letter in her name by working on the four key movements in forming letters - vertical, horizontal, diagonal, and circular lines. And up to this point, the child has traced tactile letters Aa - Mm with her finger. If she is ready, today is the first time that the child is asked to write a letter of the alphabet with a pencil. In the 3 Year Curriculum, the child will write her first name using capital letters only. If your child can write all uppercase letters and is ready for lowercase letters, the 3" Lowercase Letter printable is available to purchase. Instruct the child to trace the tactile letter. If she can correctly form the letter, give the child the 3" Letter cut from the 3" Uppercase Letters worksheet and placed in a dry erase pocket. With a dry erase marker, demonstrate how to form the letter while saying the Letter Formation Chant. Then, allow the child to write the letter and use the green and red dots as reminders. If the child's first letter hasn't been introduced yet (Letters N-Z), spend a few days introducing it with a tactile letter before writing. If the child is unable to correctly trace the tactile letter, continue practicing before writing. Moving on will only frustrate everyone. For more information, read Learning to Write. - Discuss spatial words as you read and view the illustrations. Using safety scissors have your child cut out shapes (square & rectangle) that you have drawn with thick lines on heavy paper (cardstock). When cutting, remind the child that his/her dominant hand does the cutting while the other hand moves the paper. Watch that the elbows do not point out while cutting. Check out Teaching How to Use Scissors for ideas. 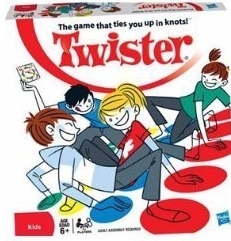 While playing the actual rules of Twister is probably too difficult for this age level, take turns calling out colors and body parts to match.